Creo Simulation Live embeds ANSYS simulation capabilities directly into the CAD tool interface. Creo Simulation Live lets engineers see the impact of their design choices in real-time. Image Courtesy of PTC. Simulation-driven design, the process of pushing 3D analysis up far earlier in the design process to drive innovation, is a key talking point in engineering circles. Yet PTC, a strong proponent of the approach, thinks most 3D design platforms don’t go far enough in creating a seamless workflow that delivers real-time feedback on designs. PTC’s solution to the problem: A strategic alliance with simulation leader ANSYS that was announced last year. Since then, the pair have been working to integrate ANSYS’ Discovery Live simulation capabilities directly into the Creo CAD platform so engineers can receive feedback and guidance on their decisions as soon as they make them. The new Creo Simulation Live tool, embedded in Creo and directly accessible through the software ribbon user interface, changes how most design teams tap into simulation, moving the capability from an end-stage validation tool to becoming an integral part of the iterative design workflow. 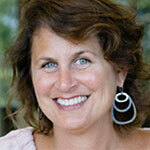 The barrier to simulation-driven design has everything to do with simplification, Thompson says. Typically, a design engineer would need to know how to setup and simplify a CAD model to achieve meaningful simulation, which is process that many engineers haven’t fully mastered. Moreover, engineers are forced to toggle between separate simulation and CAD programs, which can be cumbersome, he says. More importantly, once the model has been simplified and the simulation properly set up, the process can often take hours, or sometimes overnight, before the results are completed, which discourages widespread use of analysis to guide early design choices. Creo Simulation Live is accessed directly from within the CAD environment, and unlike other simulation functions offered by Creo and other CAD tools, this new functionality is based on ANSYS’ Discovery Live functionality to deliver real-time feedback to engineers on their choices. The capabilities offered directly within Creo have been tailored and simplified to target non-specialist users, according to the company. 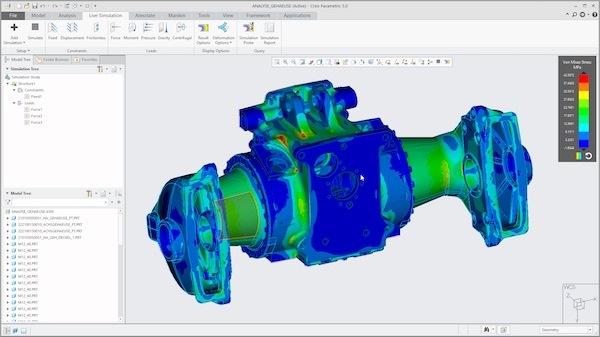 ANSYS simulation capabilities are at the heart of Creo Simulation Live. Image Courtesy of PTC. 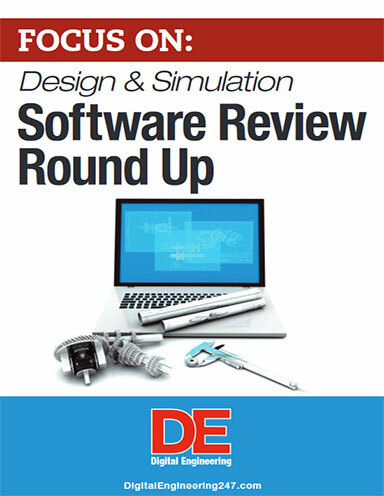 At electronics manufacturer Dakronics, the engineering organization is testing Creo Simulation Live as a way to address bottlenecks in its process and to empower design engineers to leverage more widespread use of simulation on their own. With the typical workflow, the structural analysis team ran the simulations in standalone ANSYS software with frequent back-and-forth exchanges with the structural design team until they were happy with the results. 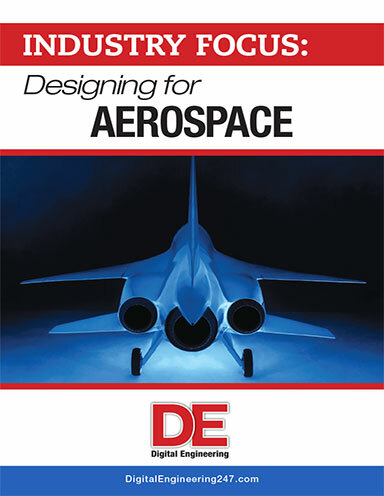 “This allows designers get into the tool and without knowing ANSYS Mechanical. They can go through different iterations in their head and explore the what-ifs,” explains Randy Soukup, an engineering systems analysis at Dakronics. 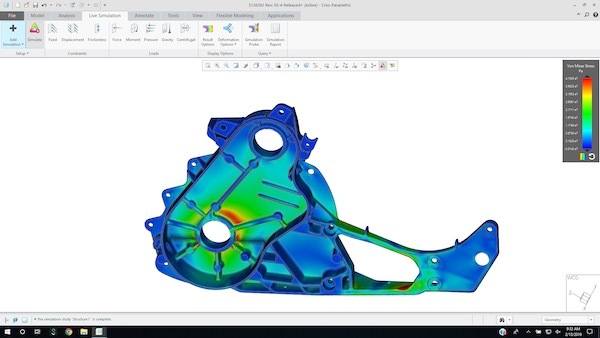 The initial iteration of Creo Simulation Live supports structural analysis and modal analysis, but the plan is to add more physics over time, Thompson says.